SEE countries, with their strengths and weaknesses, painted a mixed picture in 2012, but in general the slowdown in economic activity and rising unemployment rates put a mark on the year all around. The recession in the eurozone had unfavourable influence upon SEE countries’ foreign direct investment and external demand. All countries in the region reported slower GDP growth rates in 2012 compared to 2011. The main deterrent to the economic activity was the crisis in the eurozone, the major trade partner of SEE countries, which led to last year’s slump in exports. Low household consumption was another important cause for the sluggish performance of the SEE economies. Harsh winter, spring floods, summer drought and forest fires in the region devastated crops and affected trade, infrastructure and economic activity in the region. And yet some of the SEE economies managed to achieve growth, albeit modest, and keep inflation in check. Given the difficulties faced by the eurozone and the disastrous macroeconomic conditions in Greece and Italy, the stable picture in SEE suggests that smaller boats could survive more easily in rough waters. 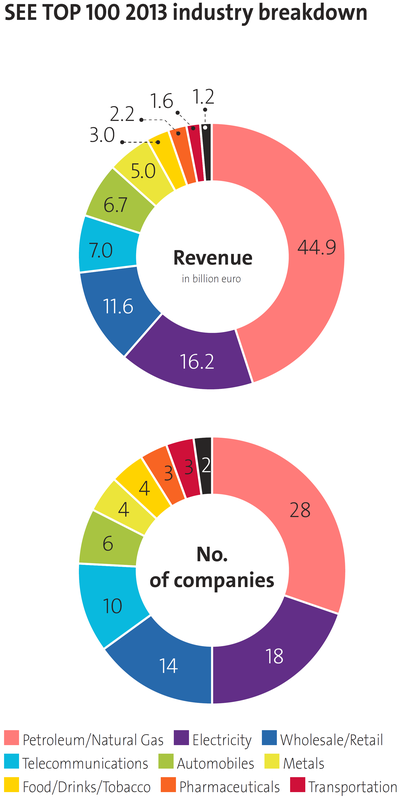 The mixed results of the TOP 100 non-financial companies for 2012 are in concert with the development of SEE economies. Despite the tough times, the combined revenues of the top 100 players grew to 103.6 billion euro from 101 billion euro a year earlier. Their total net profit, however, went down to 2.85 billion euro from 3.0 billion euro in 2011. 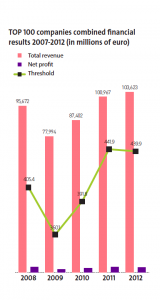 The revenue threshold for the SEE TOP 100 chart slightly declined to 440 million euro, compared with 442 million euro in the previous edition. 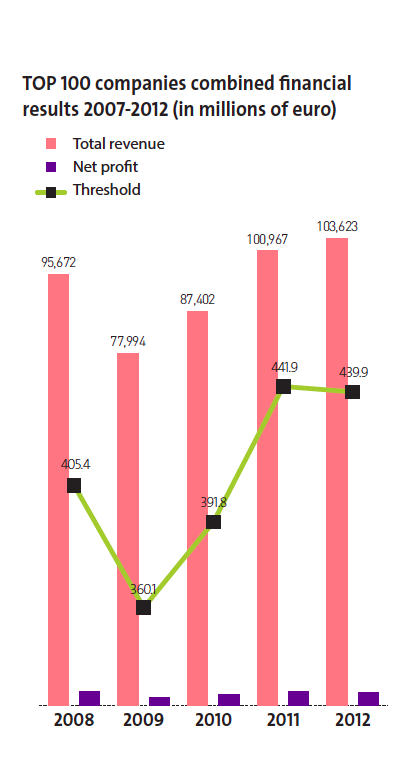 This shows that although companies managed to generate higher revenues, their profitability was not on the rise. Nevertheless, all three indicators had returned to pre-crisis levels in 2011, a trend which continued in 2012, implying that the times of tumbling earnings are over. The number of companies which saw their revenues go down in 2012 rose to 33 from 21, but they were predominantly placed at the lower end of the chart, meaning that big companies proved to be more resilient to the challenging economic situation. Romanian agricultural firm Cargill Agricultura, whose revenues tumbled 28.74%, experienced the steepest decline. As a result, it fell 32 spots to number 82 in 2012. By contrast, Bulgarian gas distributor Overgas climbed 22 spots to number 43, marking the highest jump in the 2012 chart. The best bottom line was registered by the leader, OMV Petrom, at 869.5 million euro, while the deepest loss was of 47th-ranked Serbian gas company JP Srbijagas – 310 million euro. There was no surprise at the lead, as Romanian oil and gas heavyweight OMV Petrom held its crown for the sixth year in a row. The behemoth managed to boost its revenues 18.32% year-on-year to 4.733 billion euro in 2012, thus keeping a safe half-a-billion-euro distance from the runner-up, just like a year earlier. In August 2013 the Romanian major confirmed it was pursuing its ambitious 1.2- billion-euro investment programme for 2013, which translates into a 24% surge in investments compared with 2012. The bulk of the funds will be injected in exploration and production. Surprisingly, Bulgarian oil refiner Lukoil Neftochim stole the second place from Croatian oil and gas major INA, which it had occupied for four years running. The Bulgarian giant’s revenues surged over 22% to 4.2 billion euro. Still, it remained in the red, with a net loss of 48 million euro although it improved its performance from a negative result of 69.5 million euro in 2011. INA switched places with the Bulgarian major after the former’s revenues remained unchanged at the 2011 level, but its net profit dipped by about one-third. INA is 49% owned by Hungarian oil group MOL, with the remainder in the hands of the government in Zagreb. The Croatian cabinet has been trying to reverse the deal, which gave MOL operational control over the company in 2009. Romanian carmaker Dacia slipped two spots to number seven in 2012, as both its revenues and profit were on the decline last year. Renault’s Romanian unit boosted its 2012 global passenger car sales 4.8% to 360,000. By contrast, Slovenian fuel retailer Petrol earned two spots to number five, as its revenues advanced by 14% and its bottom line soared almost 200%. The top five players – all of them oil and gas specialists – registered a two-digit increase in revenues, with the exception of INA. As usual, oil and gas firms dominated the TOP 100 ranking with 28 representatives in the ranking for 2012, the same number as the previous year. The number of electricity companies in the chart also remained intact at 18. Wholesalers and retailers numbered 14 in 2012, versus 13 a year earlier. A total ten telecoms made the 2012 TOP 100 companies list, flat on the year. Only four representatives of the metals industry were present the ranking for 2012, down from six a year ago. With the entry of another carmaker, the number of automobile companies on the list rose to five. The TOP 100 companies list accommodated 16 new entrants in 2012. Newcomer FIAT Automobili Srbija made the biggest jump in terms of sales among all firms on the list, soaring 345% and landing straight at number 88. Despite the remarkable gain, it wasn’t the highest-ranked new entry in SEE TOP 100 companies 2012. Romanian power company Electrica Furnizare debuted at number 28, on the back of a 154% surge in revenues. Romania blew away all competition with the impressive 51 companies on the list in in the chart, versus 49 a year earlier, because nine out of the 16 new arrivals in the ranking were based in Romania, while only seven Romanian firms left the chart. Slovenia outranked both Serbia and Bulgaria with 13 companies in the top 100, up from 12 in 2011. Bulgaria, which, in turn, outranked Serbia, had 12 representatives, one less than in 2011, when it was the third-strongest represented country in the chart. Serbia followed suit with nine companies, versus 14 in 2011. Croatian companies numbered 11, against 10 in the previous year. Macedonia and Bosnia and Herzegovina had two representatives each, versus one in 2011. Just like in 2011, none of the biggest companies in Albania, Moldova or Kosovo made it to the list in 2012.